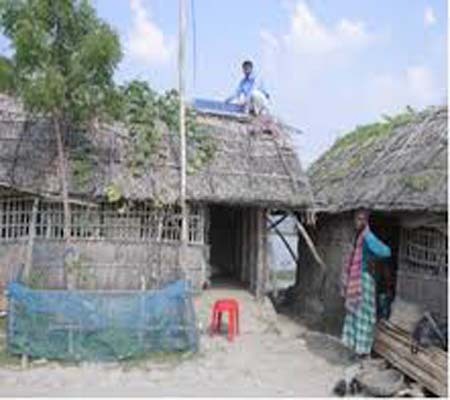 VOSD has been implementing Solar Home System (SHP) installation component as a part of Women Empowerment Program in Uzirpur, Upazilla of Barisal Districts with the support of Andheri Hilfe-Germany for three years in 2001-2003 with the technical support of ANANDO and installed 30 SHPs and in 2012-25 SHPs are installed with own supports and technical support of ANANDO and so far it has been installed 125 SHPs in the project areas, Already it has developed 30 beneficiaries, who can assemble SHPs and supply to the community people. In this regard, VOSD has providing micro-credit supports to the trained people and they have been assembling and supplying SHPs among the community people but the organisational staffs and volunteers are raising awareness among the community people to use SHPs intensively to reduce pressure on electricity, reduce fuel consumptions, fuel costs, preserve natural resources, control pollutions, control carbon emissions, control health hazards, and prevent environmental degradation and prevent climate change. Last year, VOSD has installed 25 SHPs in Satla Union.